Don't know about you, but when I'm anxious I tend to spend money on stamps (and eat, but that's another story). Given all the health stuff going on, I've had a steady stream of packages coming (until the husband suggested I start trying to win contests instead of buying. HA!). So, I decided it is time to put down the credit card and pick up some older sets and actually use them. These stamps are from a Hero Arts My Monthly Hero Kit from last summer. It is no longer available, but that's no reason not to use it. The sentiment is from Altenew's Halftone Circles. [By the way, I usually link to Ellen Hutson's shop because that is where I shop. However, of course all of these stamps are usually available at a variety of places.] Used Altenew inks -- Warm Sunshine, Buttercream, Mountain Mist, Lagoon, Emerald, Sun Kissed and Orange Cream. Altenew's Orange Cream is the perfect true orange. I've looked all over and even had friends send me orange ink pads, but they all had a brown undertone or something that didn't ring true. I'm happy with Orange Cream. It's crazy how happy this made me. Stamped on linen cardstock because I thought the texture showing through the ink would be fun. Added White Blizzard Nuvo Crystal Drops. 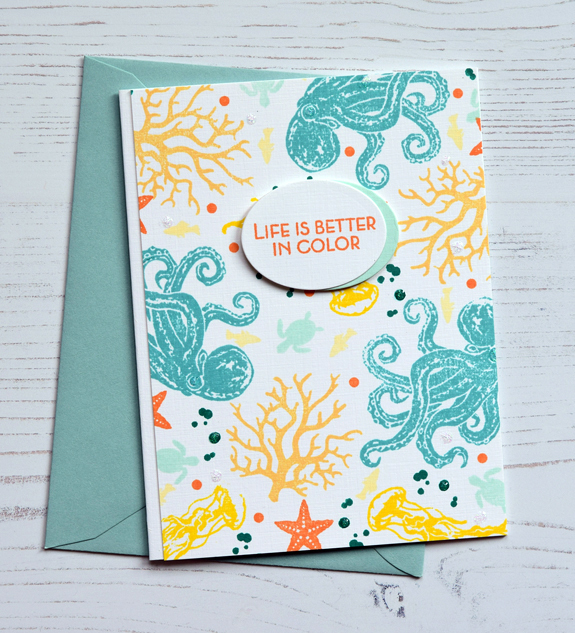 Love the colors and the stamped background. Beautiful! Gorgeous! I agree about the Orange Cream... I love the whole orange array in the new set of minis from Altenew. Let's hear it for using older stamps. Always enjoy seeing older stamps revisited. Your card is happy and colorful-we need more of each. Love, love all the color on this! I probably wouldn't know what to do with this stamp set, but your colorful card face is absolutely perfect. I hear you about the distress shopping. There are certain things that compel me to shop, and I did too much of it this month. I was thinking yesterday that I'd love to get through all my never been used stamps and digis so I can enjoy more of my older stamps. Love this card - I hope you are making your way toward some good information/answers regarding your health. I can completely relate to the thrill of shopping. This year, I am not purchasing art supplies/rubber stamps, etc. It was really hard in January, but each month it has become easier and it is encouraging me to pull out what I own - and use it. 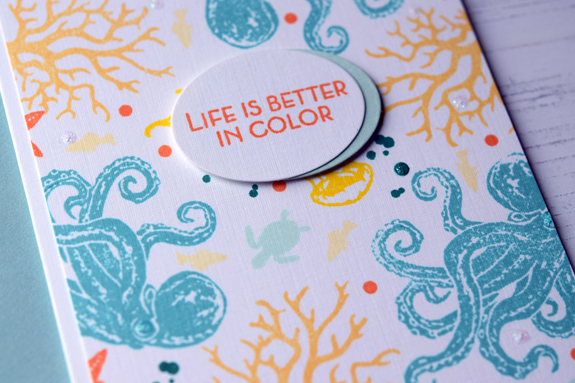 What a wonderful card -- and how blessed are you to find a color that makes you so happy!